Duos & Rizos & Pearls…Oh, my! 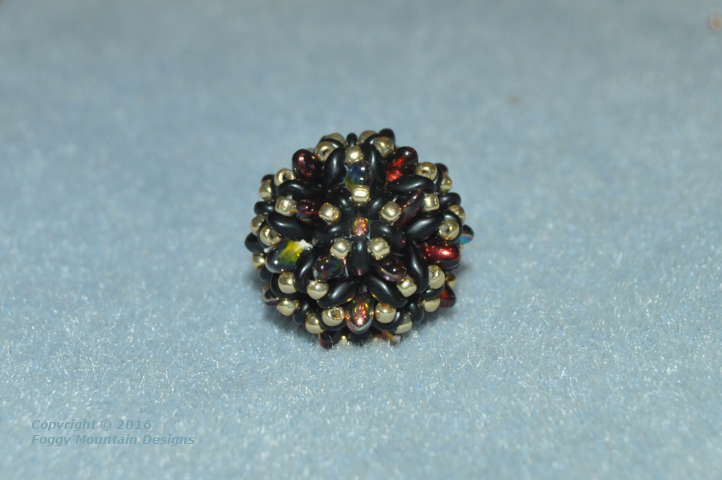 Beth, at Beading by Beth, wrote two new tutorials for beaded beads last month. 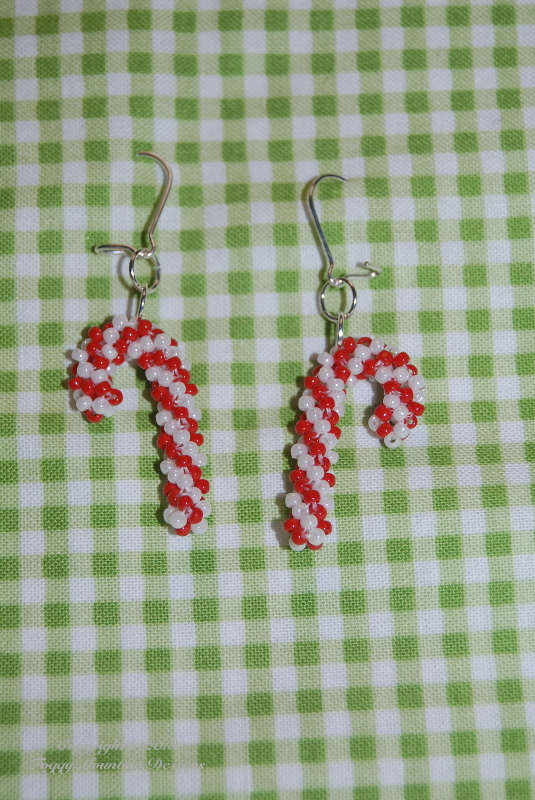 I got to beta-test them (thank you, Beth!) but I’m just now getting around to pulling the photos off the camera and blogging about them. First up is the Duocube. Tutorial can be found here. You know how there are times when you think a pattern is going to be worked a certain way and you stop following the pattern? That’s what I did with the first one I made. I embellished it the way I thought it would go instead of the way Beth had it written. But I still like it – a lot. I used mini Duos, 15’s and 3mm rounds. Then, I made another one the correct way. Duos, 11’s and 4mm pearls. I couldn’t stop there and made one more. Each side of the cube is a different color. The side you can’t see is orange. Duos, 11’s and 4mm pearls. My Dodecarizo did not photograph well. I’m blaming it on the colors. The only Rizos I had were Magic Wine. And the only Duos I had that would match were black. Not a great combination but they worked with gold 11’s to make the bead. Pattern can be found here. 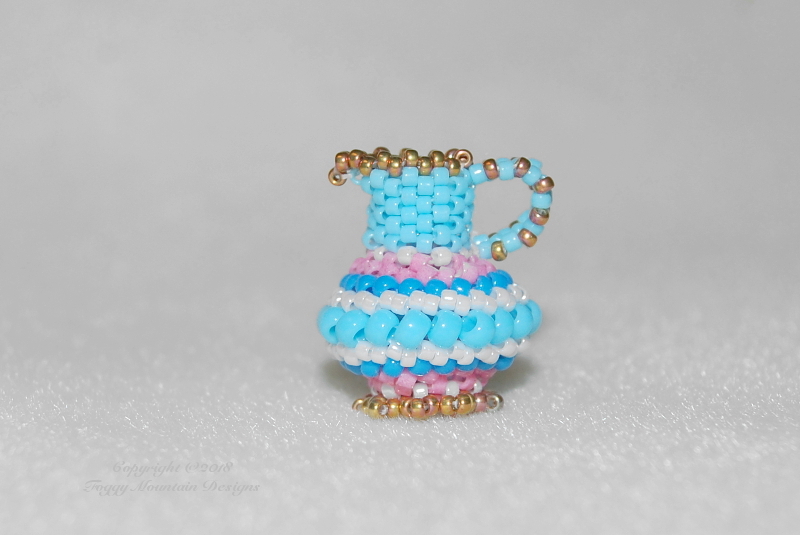 I saw the instructions for this beaded bead on Pinterest. It appeared to have been uploaded from someone’s hard drive because it was stored in the media cache and there were no links or credit given to any designer. That being said, if this is your design, please let me know so I can give you credit. 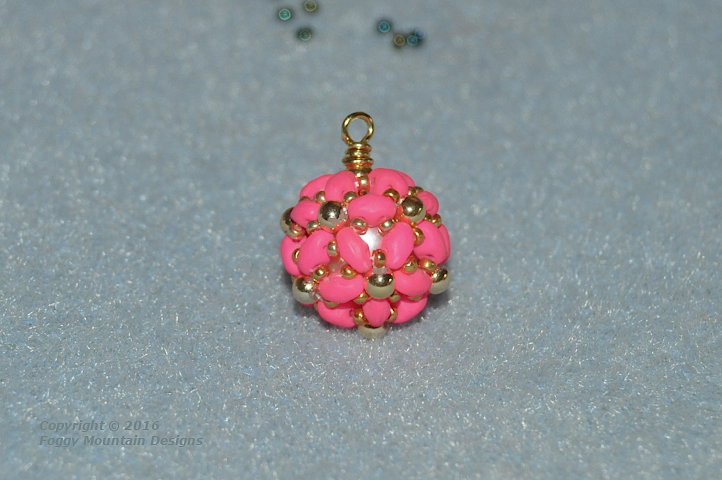 This is a fun bead to make. It’s easy and works up very fast. The tutorial called for Duos and sizes 8 & 11. I used mini Duos, 11’s and 15’s. I will be making more of these. While making a CRAW rope, I ran across a stash of ropes tucked away in a box and thought I would share them. This first one is today’s rope waiting for a clasp. From the top down: CRAW, Filled net, Chenille with Tohos, Chenille with Delicas, Carolina Spiral, 3-bead Net with tri-color cat’s eyes and Twin bead herringbone. The last two are Dutch Spirals. 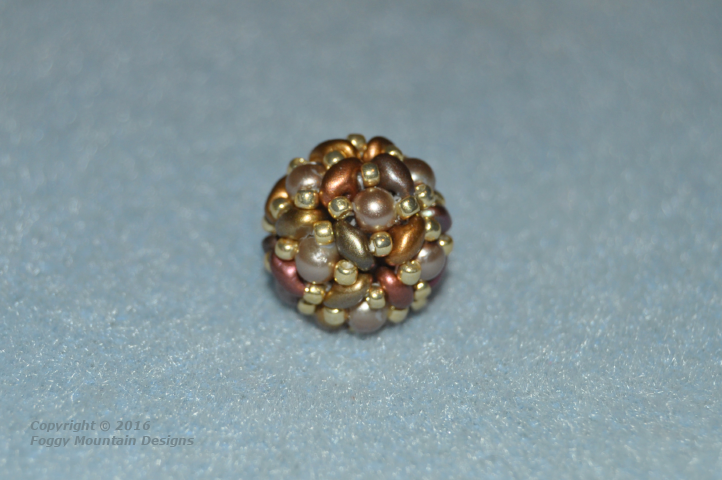 The cream/gold is my modified version made with 15’s & 3mm pearls. The blue/white is the standard way of making a Dutch spiral. 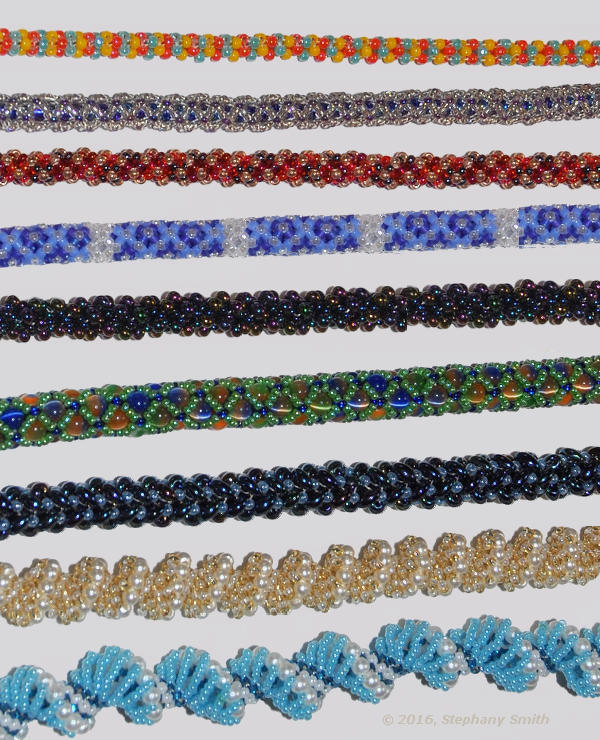 Operation Tackle that Bead Stash has a blog and Facebook group. 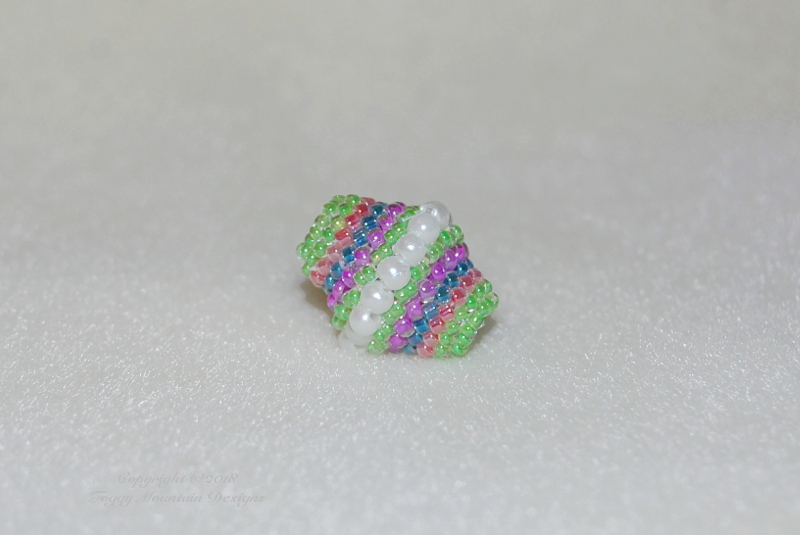 The monthly blog challenge for June is to create something using only stash beads in turquoise, green, pink and white. 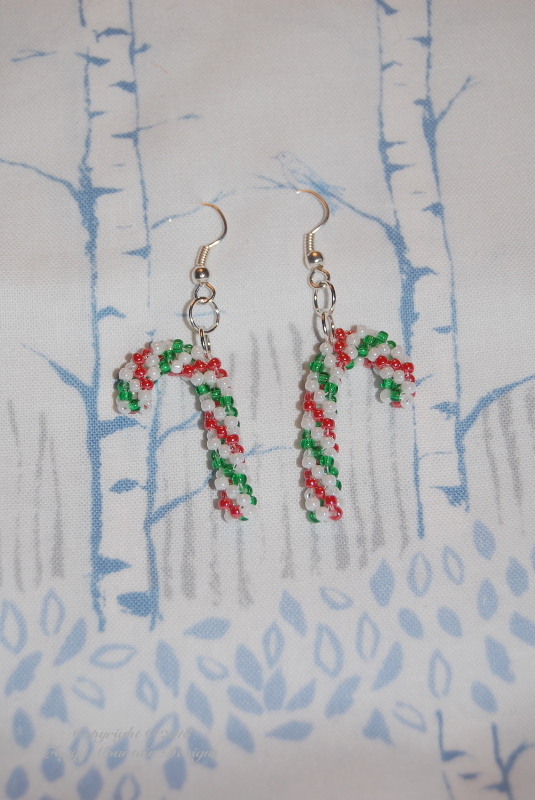 I made earrings (they look like owl eyes to me). I can’t make up my mind if you’d call it layered or stacked peyote but it is three layers. It’s difficult to tell from the photo but the edges are slightly ruffled. 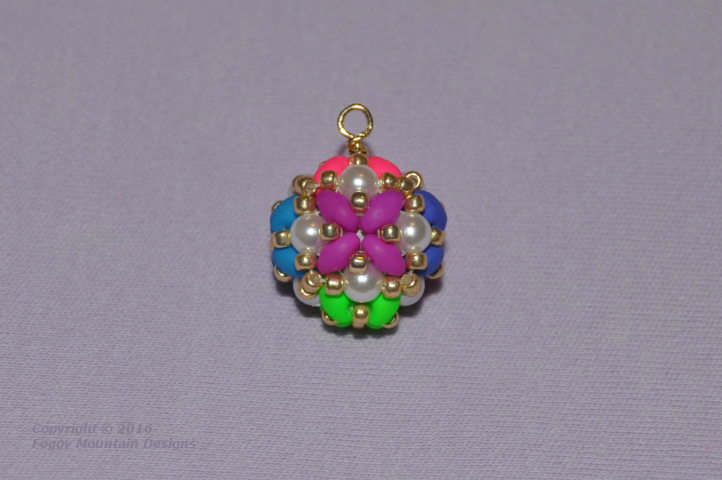 Designed and beaded by me. The ones I submitted were not my first choice. While making the one on the left for the challenge, I discovered, horror of horrors (! 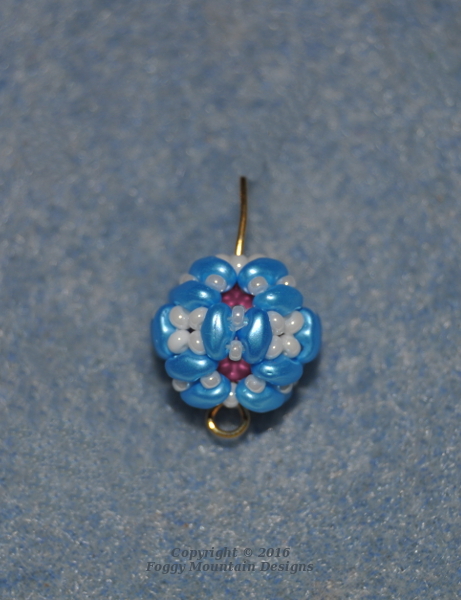 ), I only had one of the turquoise cabs. 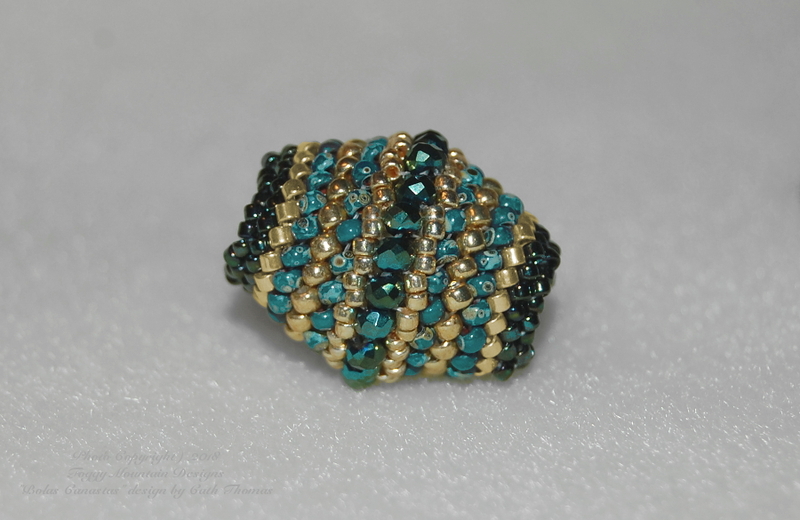 Here is how the turquoise looks from the side. 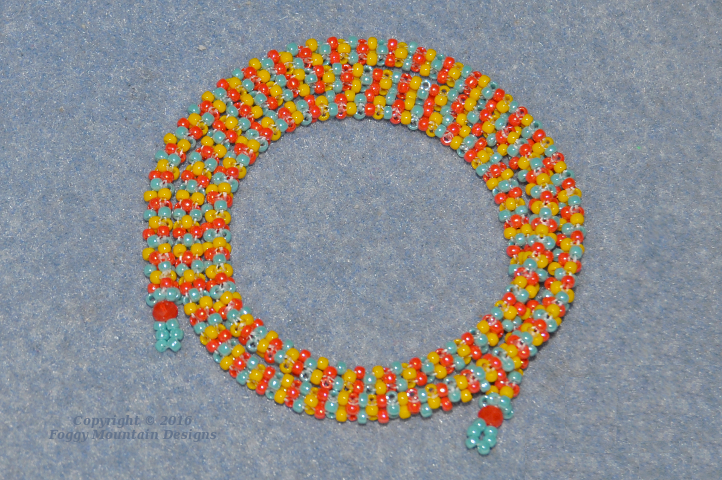 For both designs, the base row is RAW, the row layered over that is peyote. 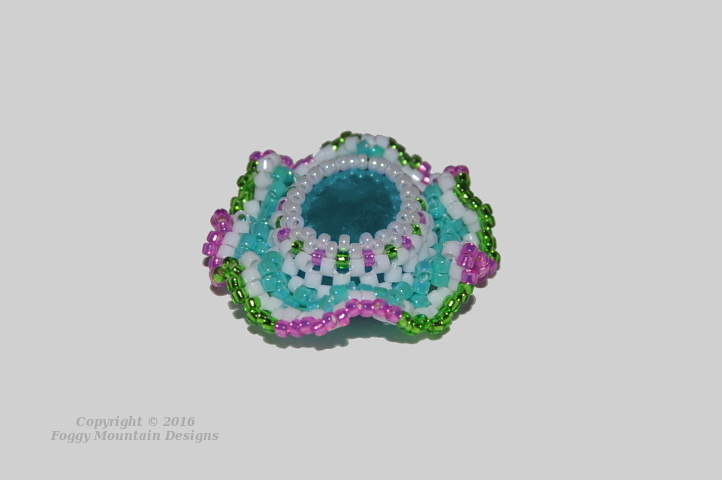 I increased the peyote from 1-drop to 2-drop to get the big ruffles. I did not do the increase on the pink ones. 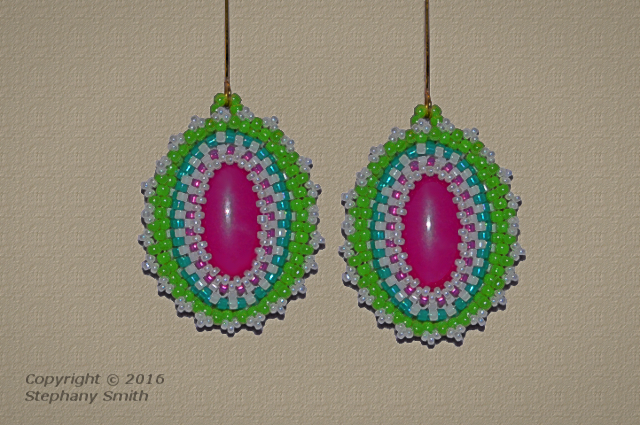 I like the pair I submitted for the challenge but I am in love with the turquoise pair. Somewhere I have to find matching cabs to make another pair.